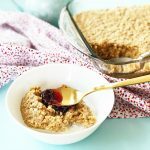 Assemble all of the ingredients for this Peanut Butter Baked Oatmeal the night before and pop it in the oven in the morning for a warm and delicious breakfast! In a bowl, combine the milk, melted butter, eggs, vanilla, peanut butter and brown sugar. I like to use a small hand blender to make sure the mixture is smooth and creamy. Set aside. In a separate bowl, combine the baking powder, salt and oats. Add the oat mixture to the milk mixture and mix well. Pour the batter into an 8×8 glass dish. To bake it right away, preheat your oven to 350 degrees, then bake the oatmeal for 25-30 minutes. For overnight oatmeal, just cover the dish and refrigerate overnight. In the morning, take it out of the fridge, preheat your oven to 350 degrees and bake it for 30-40 minutes.